The Plant Disease Clinic occasionally receives calls about small, yellow mushrooms that pop up in the pots of houseplants. What are they? Where did they come from? Are they harmful to the plant? Can they harm people or pets? In most cases, the fungus in question is Lepiota lutea, sometimes called the yellow parasol or flower pot parasol. This species can be found outside in the summer, but is most commonly found year-round with potted plants or in greenhouses. The small lemon yellow mushrooms are about 1 to 3 inches tall with 1 to 2 inch oval or bell-shaped caps. They may appear singly or in clusters. A mushroom is the reproductive structure of a fungus that spends the rest of its life cycle as a thread-like body in the soil or debris, not usually visible. That thread-like body, called a mycelium, could have been introduced to the pot in the potting mix. Alternately, a spore of the fungus (similar to a seed) may have floated through the air and landed in the pot, starting the fungal colony. The Lepiota lutea fungus is a saprophyte, which means that it breaks down dead organic matter in the pot. It does not harm living plants and mushrooms do not need to be removed for the plant's sake. However, the mushrooms are poisonous to people and animals, so if pets or small children are nearby it would be wise to remove the mushrooms as they appear. Fungicide treatments are generally not effective against mushrooms. 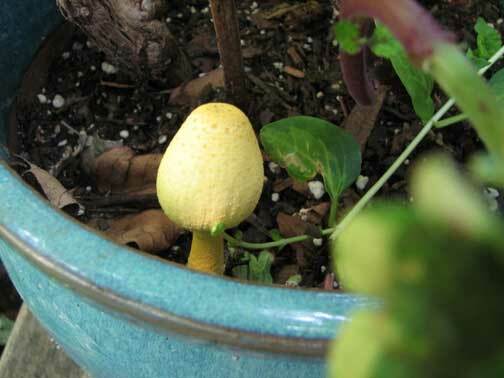 A Lepiota lutea mushroom growing with a potted plant. Links to this article are strongly encouraged, and this article may be republished without further permission if published as written and if credit is given to the author, Horticulture and Home Pest News, and Iowa State University Extension and Outreach. If this article is to be used in any other manner, permission from the author is required. This article was originally published on January 10, 2007. The information contained within may not be the most current and accurate depending on when it is accessed. One of my houseplants has several small, yellow mushrooms on the surface of the potting soil. Will the mushrooms harm the plant? I would like to grow a few vegetables in containers. Can I use garden soil or should I purchase a commercial potting mix? How should I overwinter a rose growing in a pot? I have a miniature rose growing in a pot outdoors on my patio. How do I over-winter it?